Download iMusic ios 11 for FREE and listen to your favorite songswith the best apple music player on the Playstore! our new mp3music player is designed for people who are looking for a powerfulequalizer music player. This new imusic ios 11 app provides 5 bandequalizer which elevates your music experience. iMusic ios 11 isalso a very high volume music player for people who like to enjoytheir music in high volume.iMusic ios 11 is more powerful comparedto other audio players. This mp3 music player will read your musicand audio files and process them with a powerful equalizer whichmake your songs sound more professional and stunning. Either youare a casual music listener or a die hard music lover, you willnotice the difference in the sound quality when you play your musicusing this new imusic for phone 8 app.Why you need to download andinstall iMusic ios 11 on your Android smartphone or tablet for Freeinstead of other iplayer or imusic ios 11 music playerapps?•Completely FREE to install and use forever. No need to spenda dime to purchase a powerful music player for phone now because weprovide it for you for FREE. And you don’t have to pay any hiddenfees.•Create your Playlist easily and fastly.•We support many audioformats such as mp3, aac, oog, wav, mpeg, flac, and otherformats.•Simple Navigation and user interface. Why installcomplicated apple music donwload apps that takes more time to setup? The purpose of a music player is to play music for you toenjoy, not to tweak it endlessly. You can instantly know how to usethis mp3 music player once you open our it.•Great design and userinterface that are very similar to the phone 8 and ios 11 ones. Youwill love them!•Powerful equalizer with Bass Boost.•We offer themost beautiful sound quality on the market. You will not find suchquality inside any other music player for phone.•Want to listen toyour favorite music within all your devices? It’s possible withiMusic ios 11, because our app is compatible with all smartphonesand tablets!•Want to listen to your favorite music anytime andanywhere? It's possible, because our app supports the offline modeand you can listen to music even if you don't have a 3G, 4G orWi-Fi internet connection.If you don’t believe that our MP3 playeris the best Android music player, just install this high volumemusic player now to test this out. It is FREE after all and youwill experience music from your Android device like you have neverhad before. Our iplayer app is lightweight and yet powerful withall the built in features that will elevate your music experience.We are confident that you will continue to use our media player appbecause the quality of our app is exceptional.What are you waitingfor? Download iMusic ios 11 for Free Free and enjoy listening toyour favorite music in the best way.We are always striving toprovide the best user experience for our users. We are also lookingfor your feedback, suggestion or recommendation. Please, feel freeto email us, so we can continue to bring you the best experiencesand updates. ** DISCLAIMER :- iMusic ios 11 app will only let youplay music from your own smartphone or tablet library and you willnot be able to download any music track or save it on your device. iPlayer for os 12 is music player style phone XS coming soon onfall 2018. You will have experience of phone XS Max now and notneed a phone XS. iPlayer have inspiration from OS 12 lastest theydebuted. iPlayer from iMusic team support player many format musicas MP3, WAV, MP4… Music player for íõs 12 have Features special foryou: ★ Play music ★ Play audio, ringtone ★ Create playlist ★ Showmusic for album music ★ Player all song from library music ★ Sortmusic follow name, album, artist… ★ Display now player blurbeautiful ★ Search Music ★ Repeat And next, preview song ★ Controlmusic from notification ★ Delete song from library ★ Alarm turn ofmusic ★ Slide seek bar over song ★ Volume control ★ EqualizerSetting ★ Lyrics offline ★ Many theme ★ Style phone X Thank you foruse IPlayer for íõs 12. Please feed back if you need more features. You list music everywhere. Whether you’re in a car, on a bike, orrunning a marathon, you’ll be lost in the music, not the interface.And, when you need more fresh music, you’ve got music free from youwith custom-tailored stations based on your own music preferences.Music Player Free all feature in iMusic OS 11 is free forever. Youcan add song to music player free everywhere you like. You playmusic, edit album, create playlist in iMusic easily. You controleverything in the music player os 11.Wondering what makes thesemusic apps stand out? Well, it's the ability to let you controlmusic and enliven music experience with the handy features thatmake them special. Let's find out! Turn on imusic 11 you can see itawesome. iMusic OS 11: is easily one of the best music players foranybody because it is easily use. With the highly user-friendly UI,it makes exceptionally easy to control music. Thanks to coolgestures, it lets you fine tune your music with optimumconvenience. 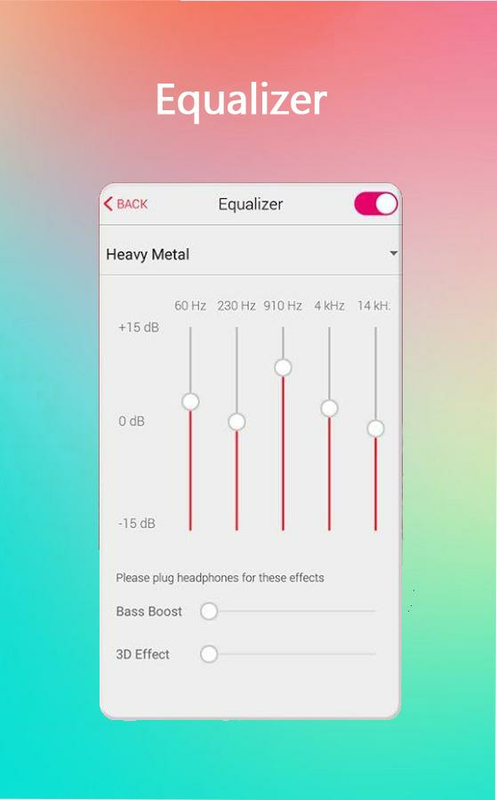 3D Touch Support you have a android phone and you havenot phone 8, you want your phone have 3D touch, now you have it.You can experience 3D touch on the phone android with iMusicfree.EQ Equalization you can custom equalization in music playerfree. Listen music as jazz, dance, pop, country, electric, rock etcor custom your EQ. Search Music Song Easy Easy search music folowsong, folow artist, album etc. If all you want out of your musicapp is to find music and start listening to it, iMusic Phone 8 isyour app. A simple navigation stack lets you drill down fromartist, to album, to song. For artists with only one album in yourlibrary, Cesium will smartly skip the album view and just take youright to the album. Create playlist music Create music playlisteasy and add song or delete song never been so easy. FeaturesiMusic Player Free: Search song, search album, search artist etcPlay all music, play playlist, album etc Ramdom music free play 3Dtouch support in imusic player free Shuffle song play Equalizercustom Add music, remove song, edit song. Play next, play later inimusic Share Song or album, playlist music Get all song and playSort song, album, playlistWhatever your specific music listeningneeds are, there’s probably an app to serve them. For most casualmusic fans, IMUSIC app, especially with the UI tweaks in OS 11,will serve them well.Thank for using app.